2) Create a Class. On the Classes menu item, select New Class. 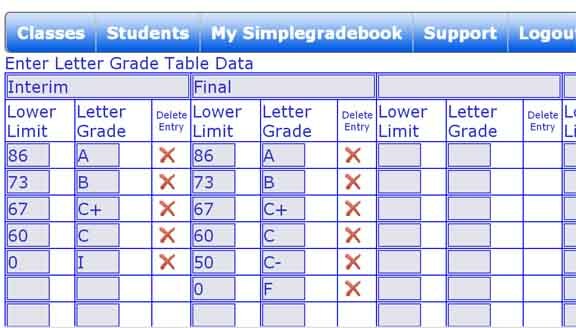 Enter the class name and select your Grade Table. There are more options you can choose but a name for the class and a grade table is all you really need to get started. 3) Enter Students into the class. Click the Classes button and you should see your class. Click the Students button and the click the Edit Students button. There are some instructions there on how to enter a student. Enter as many students as you like - even an entire class can be pasted into the Edit Students box. Just make sure each line has Firstname, Lastname and Student Number in that order. 4) Now start creating assignments and exploring the features of Simplegradebook. Have fun! 1) After you log in, click the Schools button in the Profile menu item. Then click Join a School and enter the Secret Code for your school. You can ask any other teacher in the school what the code is - they all have it in their View Schools button. 2) Follow all the steps above.